IMPORTANT NOTE!!! - DISREGARD THE "Stuffed Animal" SELECTION TAB DIRECTLY ABOVE THE "ADD TO CART" BUTTON. 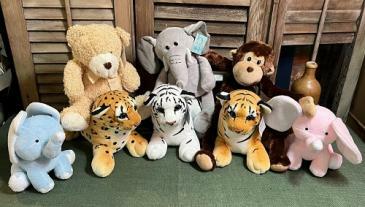 unless you really want to add another stuffed animal! Just in case we are sold out of a particular pet, you may want to list a second and third choice! (or you can always give us a call at the shop 504-529-1638!) Since we don't sell balloons these days, sometimes we get a rush of orders for these little cuties!